When you’re out looking for a base for your memory foam mattress, there’s a list of characteristics to keep in mind. 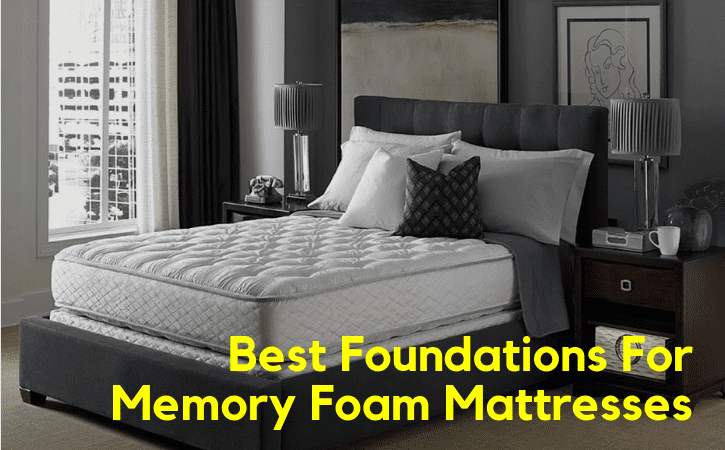 As the article progresses, you will understand more about the importance of matching your memory foam mattress with the right foundation, if you want to be able to enjoy a nice and comfortable bed. Typically, a memory foam mattress will weigh more than an innerspring one, so the foundation has to be sturdy enough to support all this weight. You will find that there are mattress manufacturers who also sell compatible bed bases together with their product, which ensure full use of the bed’s functionality. I owned a traditional spring mattress in the past, chances are you own a box spring foundation. This is a very common match because a box spring allows you to get the best out of your spring mattress. Following the same principle, you should seek to purchase a foundation that can help you get the best out of your memory foam mattress. Typically, if the box spring is more than five years old, you’ll most likely need a new foundation, unless the one you currently have is in tip-top shape and you absolutely want to keep it. This is one of the most common types of bed foundations that are chosen by memory foam mattress owner. It’s important to make sure that the slats are close enough to one another as to prevent the mattress from sagging. They also need to be made from high-quality wood, to support the weight of the mattress, as well as your own (and your sleeping partner, in case you share your bed with someone else). In general, manufacturers of such bed foundations will specify that their product is compatible with memory foam mattresses, which means that the slats have gaps of maximum three inches between them. One good product fitting this category is the Zinus Modern Studio 10 Inch Platform. It’s a metal bed frame with wooden slats that features foam padded tape to make sure there\’s no disturbing noise. It comes with a five-year warranty and plastic feet that prevent the bed from sliding or scratching your floors. There are a lot of advantages to owning a metal foundation for your memory foam mattress. One of the first benefits is the ease of assembly. Some of these foundations are foldable, which means that installing one takes under five minutes. In other cases, it’s all a matter of fitting in some legs and tightening a few bolts and you’re good to go. Of course, the choice depends on what you need the foundation for. If you want it for permanent use in your bedroom, you don’t really need a foldable bed foundation. These are more popular amongst homeowners that want a spare bed base for a guest bedroom or want to have one at hand whenever they have out-of-town guests or the kids are home from college for the holidays (assuming you turned junior’s bedroom into a study or a gym by now). The Classic Brands Hercules Heavy-Duty 14-Inch Platform Metal Bed Frame is a great choice if you’re looking for a solid foldable metal bed. It claims to be able to support every mattress type. Because it’s foldable, it’s also easy to assemble, without the need for any additional tools. 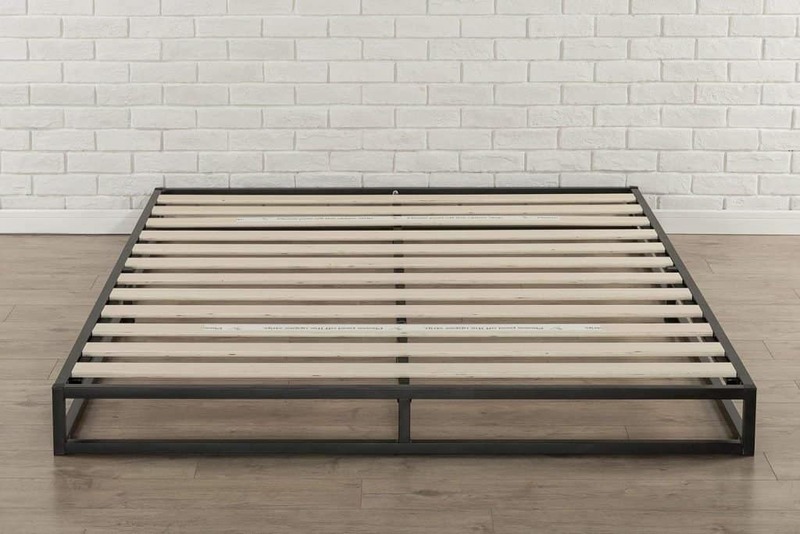 Alternatively, you can opt for a non-foldable metal bed frame, like that one from Olee Sleep. It’s compatible with a headboard, in case you plan on installing one of those, and all the assembly tools are already shipped within the package. The adjustable bed frame for a memory foam mattress is basically the next level in bedding comfort. Just as the name suggests it, this type of foundation can literally adjust your position in bed, by elevating the head and/or foot area, to put the sleeper in all sorts of comfortable positions. For instance, by raising the head area to a specific angle, you will feel more comfortable lying in bed to read a novel or to watch TV. There are people who also prefer to grab their laptops and do some work in bed (especially on cold winter days), and the adjusted angle provides a great deal of comfort while eliminating the need for a wedge pillow. The foot area is typically elevated to improve blood circulation, but also to alleviate lower back pain and maybe sooth a patient that’s recovering from an accident. 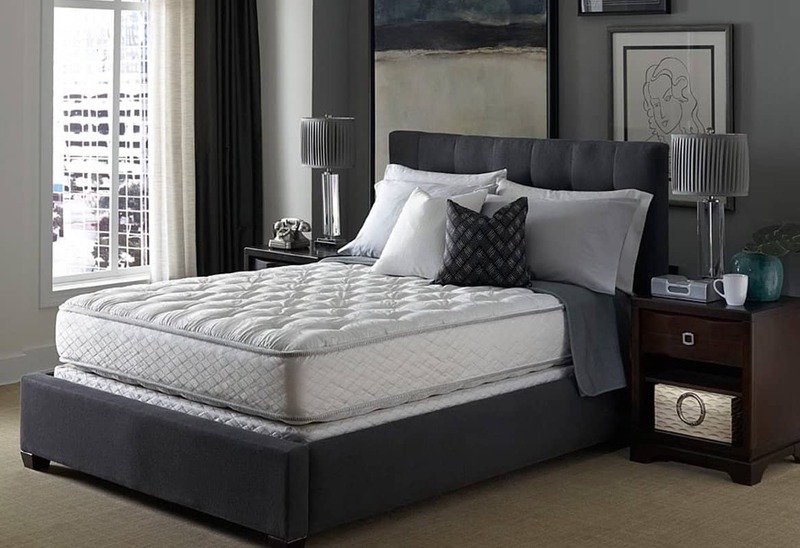 Because mattress technology has evolved at a significant pace, adjustable beds now have plenty of other features that enhance the comfort of the sleeper by integrating all sorts of features into the foundation. Of course, each one of these added features will also add to the total price of the base, but you can purchase a more basic model if all you’re really interested in is the head and foot elevation features. 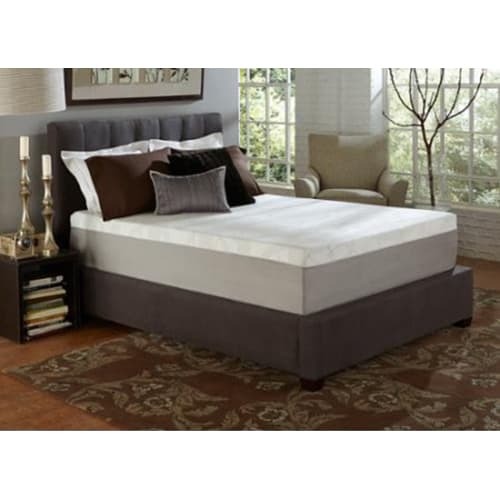 Those of you interested in such a basic model can opt for the Brooklyn Bedding Electric Adjustable Bed Base, which is affordable, quiet and solid, being able to support a total weight of 1,000 pounds. Stepping up their game, bed foundation manufacturers have integrated USB ports and outlets to their beds, meaning that nocturnal smartphone users won’t have to worry about not being able to browse social media while their phones are charging. Take the Classic Brands Comfort Upholstered Adjustable Bed Base, for instance. 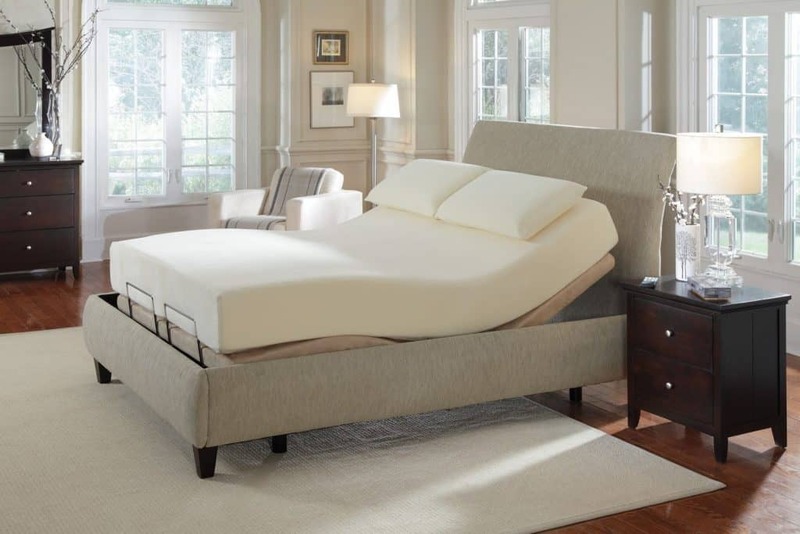 It comes with all of the aforementioned features, as well as a wireless remote control for easy operation, adjustable height legs, massage technology and even an anti-slip bar that’s located at the foot area, to prevent the mattress from sliding off the foundation when its head and foot areas are being elevated. With adjustable bed foundations, you will always be tempted to purchase the most expensive models, because, let’s face it: who doesn’t want a spa in their own bedroom. However, such products are extremely pricey, so you might want to consider sticking with a bed that has the features you really need. Oh, and we advise buying a foundation with some sort of anti-slip measures, just to keep the mattress in place whenever the bed is being operated. Another important thing? Quiet motors. You may find yourself in a situation where you or your sleeping partner want to adjust the angles of your side of the bed while the other one is sleeping. If the motors make a lot of noise, there’s some obvious disturbance that could turn out to be very annoying and wake the other one up. The most expensive adjustable bed foundations have even more features than all that we’ve mentioned so far. They include under-the-bed lights, which make it easier to walk around the bedroom with the lights turned off. Some of them have Bluetooth connections that allow you to pair your smartphone and your bed, eliminating the need for remote control. Other adjustable beds come with back-lit remote controls, so you can find the right buttons without having to turn on the light. There are a lot of people tempted to buy a bed frame or foundation with a lot of under-the-bed clearance. That’s because we want to be able to benefit from every square inch of extra space. When there’s sufficient space under the bed, we like to store all sorts of boxes and containers, to keep away stuff like shoes, toys or even tools. If you live in a small apartment, that under-the-bed storage space becomes even more appealing. But consider this: If you opt for a bed frame that measures 15 inches in height, plus a mattress that’s another 10 to 15 inches, you could end up with a bed that’s too high and difficult to get in and out of. Of course, this depends on your mobility and your height, but if you do end up in such a situation, you should know there’s a good solution to prevent it from happening. A low profile bed foundation is kind of like a regular box spring but compressed to a very small height. Classic Brands Instant Foundation Low Profile foundation is an example of such a product. It’s a foundation that measures a mere four inches in height and provides a low-cost, low-profile alternative to the traditional box spring. If you’re new to this whole bedroom furniture thing, you may be confused as to which exactly are the differences between a box spring and a foundation. Let’s examine those differences to determine which of them really is more suitable for a memory foam mattress. The most basic definition of a box spring would be a solid block of material that’s meant to provide mattress support. Of course, there are several technicalities to this definition. A box spring can contain metal or wooden slats. It can have a reinforced edge to offer better support. It can feature springs that absorb shock and enhance the durability of your mattress. People have been using box springs because of their support and the flat surface that protects the mattress. Since the slats or support rods of the box spring is typically covered with material, they will prevent the mattress from sagging and make sure that you can fully enjoy every square inch of your bed. In fact, there are mattress manufacturers that recommend using their products together with a box spring, in order to make sure warranty claims are met and the mattress has a supportive surface to lie upon. Because the height of your bed is an important factor in determining the ease of getting in and out of it, manufacturers now sell box springs of different heights. What a lot of people don’t know is that the bed height should always be correlated with the height of the individual. But can you actually tell if your bed is the right height for you? Yes, you can. By sitting on the edge of the bed, your feet need to lie flat against the floor, while the line between your hips and your knees should be parallel with the floor. In case your feet don’t touch the floor while your knees and hips are aligned, it means that the bed is too high for you. Alternatively, if your feet to touch the floor, but your knees are above your hips, that means the bed is too high. Of course, there are disadvantages in using a box spring together with your memory foam mattress. First off, there’s the space issue. A box spring is basically a giant block of material and a heavy one at that. So, not only does it take up a lot of space, but it’s also very heavy and hard to move around if needed. It’s safe to assume that you won’t be moving the bed around the house every day, but when you’re redecorating, it will be hard to get around it. If you’re looking for something more portable, a foldable metal bed foundation is definitely a wiser choice. There’s always the possibility of deteriorating the bed slats. Even metal bed slats can bend under heavy pressure, not to mention that wooden slats can break without the sleeper even noticing at first. That’s why purchasing a new mattress should always imply buying a new bed base to go along with it. Bed foundations are typically a solid block of wood that doesn’t have slats and which is used together with a bed frame. The foundation of a bed generally has some form of flat surface adhered to the top, to provide the mattress with a good deal of support. The bed frame is, of course, optional. In general terms, the benefits offered by a bed foundation are pretty similar to those given by a box spring. They will both absorb shock and increase the durability of your memory foam mattress. Another proven fact is how foundations are better at evenly distributing the sleeper’s weight across the surface of the bed. Because of their construction, bed foundations are more versatile in terms of what types of mattresses are compatible with them. The downsides of a bed foundation are very reliant on the construction of the mattress you’ve chosen to purchase. While they are typically easier to move compared to a box spring, they are still very heavy and will require more than a single-person-manpower to do so. Because of their construction, foundations add a lot of firmness to the bed, so it’s important to consider the balance between a plush mattress and a firm bed foundation whenever you’re shopping for either of these. The best foundations for your memory foam mattress are those made from either wood or metal. They should both be durable and sturdy enough to support the combined weight of the sleeper(s) and the weight of the mattress. Next, you need to make sure that the foundation matches the size of the mattress, assuming that you’ve purchased the mattress first. The biggest bed foundation brands will sell their products in a variety of sizes, from Twin to California King. If, for some reason, you have a mattress that doesn’t have a standard dimension, pay close attention to the measurements of both the mattress and the foundation, to make they’re a match. As always, trial and warranty are two factors that should always weight in your shopping decision. On average, a bed foundation has a warranty period of about five years, but there are manufacturers that stand by the quality of their products and offer lifetime warranties. Slats are important because they will carry the entire weight of the bed on their shoulders. If you opt for a basic foundation, you will need to add the wooden slats yourself or call in an expert to handle that. Wooden slats are often preferred to wired support because they have higher chances of keeping your mattress from sagging. The conclusion is that you don’t really need a bed foundation for your mattress, but there are a lot of disadvantages to not having one. 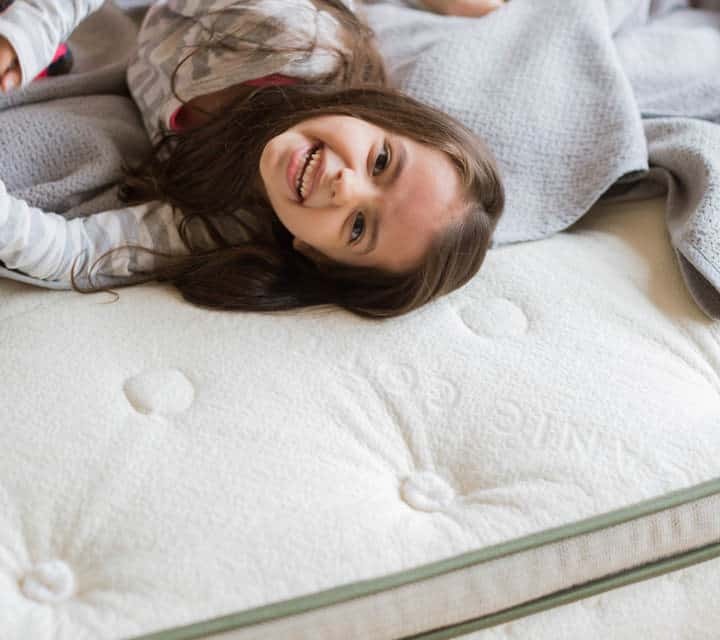 Assuming you’ve ever considered placing your memory foam mattress directly on the floor, you should know that you’re exposing it to intensive wear and tear. There’s also hygiene to be considered when you’re sleeping so close to the floor. A mattress that’s sitting directly on the floor will be more exposed to dust mites and humidity, as a bed foundation allows the mattress to breathe more and stay fresher for a longer period of time. When you have a firm base for your mattress, that’s when you’ll be able to enjoy its benefits to the max. The Layla vs Bear Mattress – The Memory Foam Battle!